On April 18, 2017, at Facebook's F8 Conference, the Workplace team made several announcements that extend the functionality of Workplace to include much more useful functions to improve a company's ability to get more done, make faster decisions, and communicate better. Many of these announcements are long awaited improvements that will make many organizations very happy. I will summarize each in this blog. You can watch the Workplace presentation at F8 at watch the announcements first hand. Working on a document with a team is a major pain point in organizations. Whether it is dealing with the multiple versions that get created with each email attachment to trying to figure out which comments to address from all the places where they live, in email, comments, and in the document. Workplace seeks to improve this messy process by helping people have conversations around the document. According to Workplace, "it is better to have conversations around documents." as opposed to just asking people to review a document and provide feedback. So, Workplace announced integrations with the following document services. Salesforce is not strictly a document service, of course, but the principle is the same in that now you can share a link to a Salesforce Opportunity, for example, and a rich preview will show up in the Workplace group. Now you can share a link to a report or a dashboard or an opportunity and spark a conversation in Workplace to get relevant people involved, in particular people who should be involved in the discuss who may not have access to Salesforce. This is a big win for many organizations. It has always been easy to go live in Workplace using your desktop browser and your mobile phone. This was great for in the moment communications. And the only substitute for communicating in video is communicating in person, which is not often possible in a global economy. Sometimes you need to deliver high quality and high reliability video communications to your employees. With the Workplace updates to the Live API, you can now deliver live video using professional broadcasting software and with external high definition cameras. Large organizations that want to stream live video on Workplace that is high stakes and high quality can now do so. Just point your A/V team to this link, and they will know exactly what to do to host CEO Q&As and other all-hands company meetings on Workplace. In just one example of what you can do, new Viacom CEO, Bob Bakish, used the LIVE API to broadcast the new company strategy to everyone at Viacom on Workplace. Rather than send out a boring email, a live video was used and employee questions could be addressed in the moment to clarify anything. Plus, the recording of the video was automatically saved to Workplace. Leaders at all levels could be better communicators and live video is one means for helping leaders communicate better. One major friction point in organizations is how to update people who missed meetings. Yes, you can take very good notes and email those out, but who reads those notes anyway? And who takes notes well enough and with enough detail that context and nuance is captured properly? Answer: No one. Yes, you can record a meeting in a virtual meeting tool and send out the recording. But who remembers to record the meeting? Who then wants to convert the recording, upload it, send it out, and make sure everyone has access to it? Even if you can or want to do all of that, the recording file might be too big to attach to an email or people have to log in or fill out a form on the virtual meeting product website to view the recording. All of this friction goes away with the new BlueJeans integration with Workplace. Now, you can host a meeting on BlueJeans and stream it live to a specific group in Workplace. Not only can members of that group watch the meeting live, even though they were not involved in the meeting or people who should have been in the meeting can watch the recording of the meeting, which is automatically saved to the Workplace group. Automatically. And there are no limit to the number of videos or the size of the video files. These are important enterprise-grade integrations. 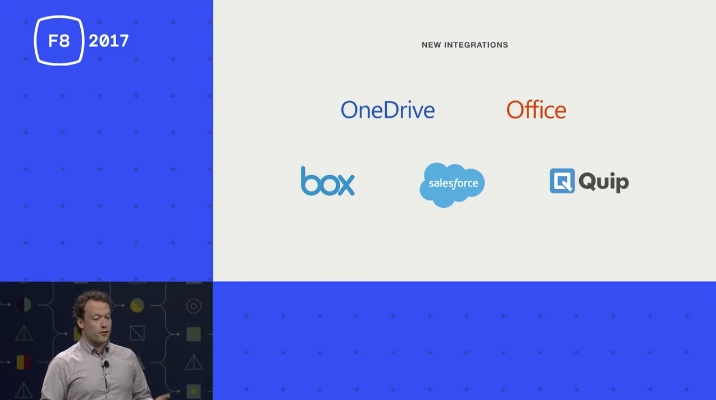 And the final announcement from F8 is the ability for organizations to create their own custom integrations with other enterprise software. Examples include integrating with ERP, CRM, ITSM, HR, facilities and asset management tools, to name a few. Also part of the custom integrations announcement is the ability for people to create customer bots. Bots come in two flavors: Bots in Groups and Bots in Chat. Chat Bots: Chat bots in Workplace are based on the Messenger bot platform. In fact, according to Simon Cross of the Workplace team, "You can take the sample app from our developer website, the messenger sample app, and point it at Workplace's APIs...and it will just work without changing a single line of code." Group Bots: Group bots are built specifically for Workplace. A Group Bot can post in a group, comment, and like posts. People can also mention the bot to make requests. For example, an "IT Help desk" bot can create a ticket from a Workplace post. The bot will reply with a ticket number and comment back when status updated and / or closed. This article shows you only the beginning of what is possible in Workplace. If it sparked questions and ideas for other integrations, but you do not know how to create them yourself, you can learn how by taking our course called, Create Custom Integrations in Workplace. In this course, you will learn what is possible in the Workplace integration function, and you will create an early draft of a plan to create your own custom integrations. Individuals can sign up for the public, virtual course or teams can take a private version of the course. Contact us to learn more and go to the course page to learn more about the course and register.